The Thirsties Duo Wrap Size 1 will fit a 6 lb. newborn all the way to 18 pounds! 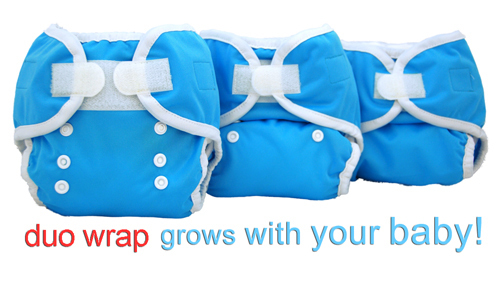 Additional sizes available for babies 18-60+ pounds. Thirsties Duo Wraps - Size One for Babies 6-18 Pounds! Thirsties Duo Wraps are diaper covers designed to fit babies from birth through the potty training years with their perfect two-size diaper cover system. 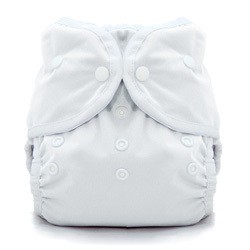 After extensive research, development and testing, Thirsties concluded a one-size diaper cover would not be the most affordable option for parents of diaper-aged children. 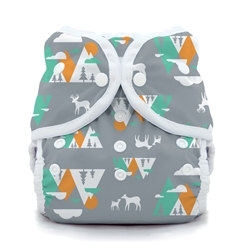 Not wanting their diaper cover to be too big on an average newborn or too small for a toddler over 2 years of age, they threw out their prototypes for a one-size diaper cover, added an adjustable rise, and created the Thirsties Duo Wrap instead. 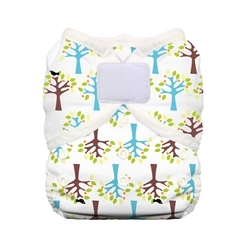 Trim fitting Thirsties covers are a smart selection for families using prefold diapers. 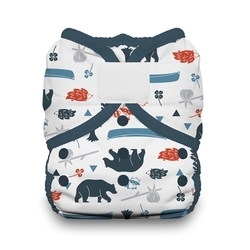 Folded and wrapped around baby or trifolded and laid into the diaper cover, Thirsties Duo Wraps' leg gussets provide the leak-proof coverage and protection needed. 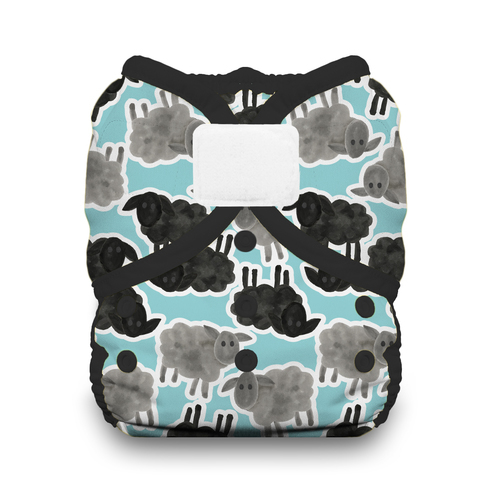 The super-soft leg bindings are an added benefit against baby's sensitive skin. Thirsties Duo Wraps are also recommended in combination with your favorite Thirsties Natural Fitted Diaper. 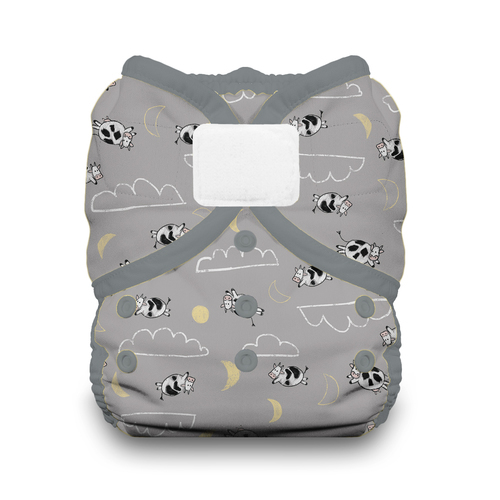 The Size One Duo Wrap can fit over both the Newborn and the One Size fitted diapers.For night-time diapering or bulkier fitted diapers, the Thirsties Diaper Cover is designed for a roomier fit. 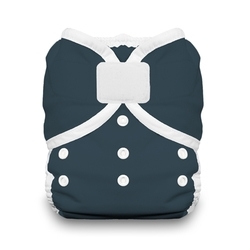 Baby's delicate skin needs a breathable, yet waterproof diaper wrap! Thirsties Duo Wraps may be lighter on the budget, but they didn't cut out any of their great features to get there! Completely waterproof, Thirsties Duo Wraps are still breathable, pliable, and comfortable for baby. 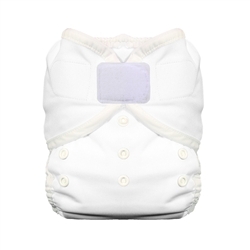 Secured around baby's waist with durable hook and loop closures, diaper changes are easier and baby gets a comfortably snug fit every time. Aplix or Snap Closures Easily Adjust to Fit Baby! The fold-over laundry tabs found on the Thirsties Duo Wraps with Aplix closures protect any other diapers or covers in the wash, as well as guard against the hook and loop closures gathering up lint. 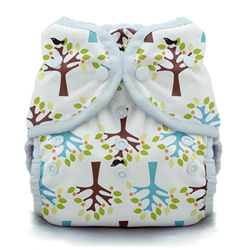 Three rows of snaps in the rise allow the perfect adjustability to conform the diaper cover to your baby's shape. 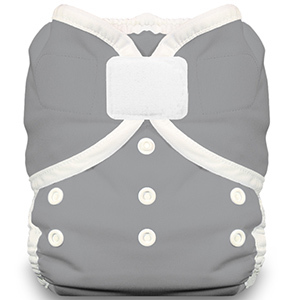 The snap setting creates the option for three different fits/sizes in one diaper cover. Though many diaper covers boast coverage on certain "size" babies, Thirsties Duo Wraps can honestly say they can cover tall to short and thin to chunky babies because of their innovative adjustable rise and snap settings and their two-size diaper cover system! Size Three - 40-60 lbs Coming soon! Thirsties Duo Wraps are USA-made by skilled woman, many of whom work from home. 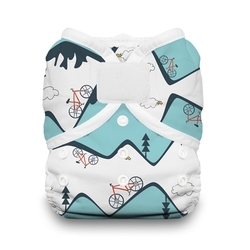 In an effort to reduce their carbon footprint, Thirsties uses only the best of USA-sourced components in their diapers and diaper covers. They support domestic textile mills and carefully consider all the fabrics to ensure your purchase LASTS! 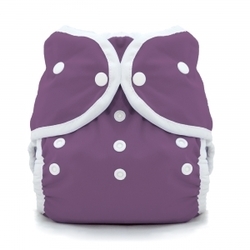 Thirsties Diaper Covers wrap around baby's cloth diaper securing a leak-free, yet comfortable cloth diapering experience for babies and their caregivers. Now with NEW & IMPROVED hook & loop closure! 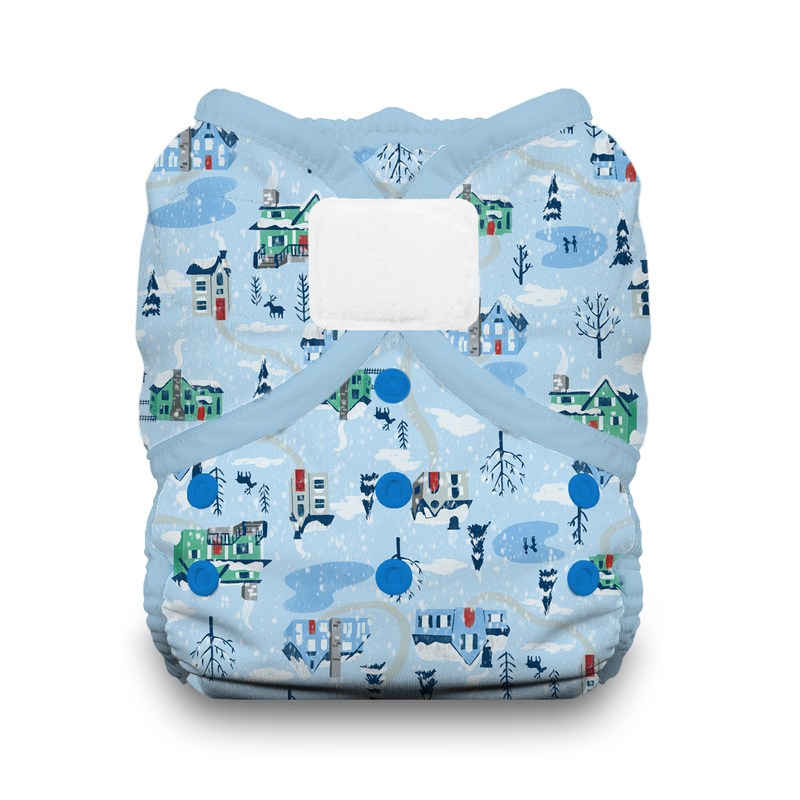 Thirsties Stay Dry Duo Insert is affordable absorbency! 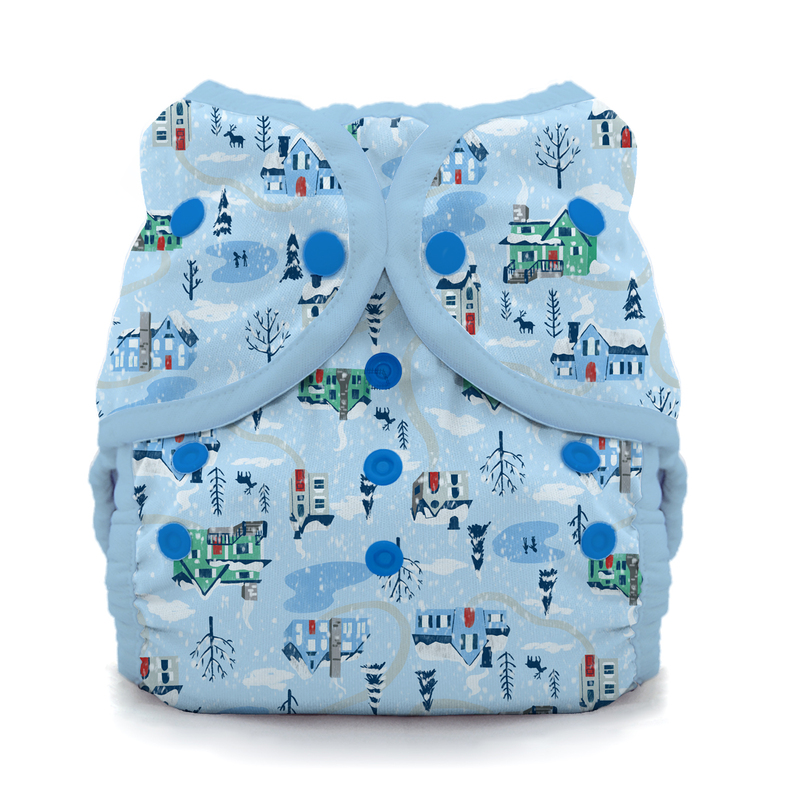 Easy to use, clean and quick to dry, the fleece-topped insert absorbs moisture away from baby's skin while remaining nice and trim! A beach or pool ready version of the reliable and popular Thirsties Dup Wrap cover! I love this cover. This cover fits perfectly for my super tiny baby. She is over a year and this cover still fits. I also love all the cute prints! Love the fit HOWEVER, I got in white and was so disappointed by how thin it is! I didn't even wanna put it on my baby thinking that it would go through, but I did eventually and loved the fit! After less than a month of usage though, the front part was completely delaminated! I never wash in super hot temperatures and I never tumble dry too. I contacted thirsties and they were happy to send me a replacement (1 year warranty, awesome company!). I asked if I could get a different colour bcs I didn't like how the white gussets get stained easily. I received one in stargaze and guess what? The PUL seems soooo much sturdier on this one! I think the white got delaminated bcs of how thin it is, the material felt cheap. I suggest skipping the white one and get the other prints or colours! My wetbag in fallen leaves also feels more sturdy than the white. These covers are great! 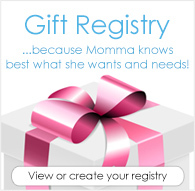 There are tons of great prints and colors available and the fit is perfect! I would recommend this cover over all others! Fit my youngest from his first day of life (at 8 lbs 10 oz) and we have never had a leak. If you are looking for covers to fit a newborn under their stump but don't want a separate newborn stash, I highly recommend size one. My only complaint is the skinny elastics on the legs are completely relaxed by about month 9 of use. I never put them in the dryer .